How much does a typical outdoor project cost... when done correctly and in a timely manner? We prefer to be very frank and forthright with all of our clients about the possible costs of their projects before we get started. Simply put, it leads to a higher level of client satisfaction. While every hardscape, landscape, and pool project is different, we can help you determine a general budget range for many common projects based on what similar projects have cost in the past. However, there are several factors which impact the final cost of any project. Such as; selection and quality of materials, site conditions, accessibility, existing conditions, specific design tastes, finishes, etc. The following cost ranges should assist in helping you effectively plan your outdoor project. Sometimes projects do cost a little less than the figures used below but we feel its better to plan for higher figures just to be safe. A simple front or rear home landscape project including focal point trees, shrubs, perennials, bedding and boulders is in the $7500 range and up. The size of the home directly relates to the cost of additional bedding and materials that may be needed Landscape renovation projects can typically fall into the above costs or more if the it's a complete redo, however sometimes properly placed trees and other focal points can be pruned and salvaged to keep the costs down. A typical landscape lighting package with smart phone control and LED lights typically will start in the $3000 and up range. This could include uplights on the house, trees, and other focal points. Also path lights, pillar, wall, and post lights can be included depending on design and preferences. 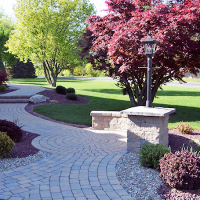 A simple paver walkway without steps can start in the $5000 range. A more exquisite paver walk including steps and/or other details like a seating wall or pillars can cost in excess of $10,000. Adding a built in grill with bar seating usually starts in the $11,000 range. This could include a Weber built in grill, or better, and granite countertops on top a block and masonry structure. Adding additional features such as refrigerator, cabinets, etc., will add $1500-4500 to the cost for some of these features. An average in-ground liner pool may start in the $30,000 range. An in-ground concrete/gunite pool will typically start in the $50,000 range. Regardless of pool type, preferences of a spa, heater, and water falls will add to the budget. A simple paver patio and bullnose coping around an average size pool usually starts in the $15,000 range and up. This price includes additional work around the pool to ensure that nothing settles around the pool edge. A concrete patio with cantilevered bullnose coping typically starts in the $9500 range and up depending on textures and overall size. Landscaping and grading around the pool is in the $10,000 range and up. This would include some focal point trees or privacy trees. Along with shrubs, perennials, boulders, bedding, and lawn grading. Some considerations with a pool project are current and proposed grading and drainage, this may include additional retaining and grading at completion of project. Fencing around a pool typically starts around $6000 and up depending on number of gates surrounding an average size pool. Fencing in the entire property along with the pool will add to the above cost. A simple built in wood burning firepit start around $1,500 and up, adding a gas burner and log set to a firepit can add an additional $1,500 to the cost. A fireplace built with wall block and stone accents will start in the $12,500 range and up. A complete masonry fireplace with stone veneer usually starts in the $18,000 range and up. The following details will add to the cost such as size, stone accents, wood boxes, or gas insert. A wooden pergola will start in the $3500 range and up with necessary staining periodically. A vinyl pergola will typically start in the $5500 range. A simple free-standing pavilion built onsite and wired for electric will start in the $12,500 range and up. This includes posts set on footings with exposed wood stained cathedral ceiling. Adding stone pillars to the base can add $5000 to the cost. A patio roof attached to the back of the house with similar details will usually start in the $19,500 range and up.